How to choose mountain bike handlebars: A distant relative of the steering wheel, the mountain bike handlebar relays input from a rider's upper body to the front end of the bike. Whether performing daring aerial maneuvers or straining to keep the front wheel planted on a steep climb, handlebars can make a considerable difference in the ride quality and characteristics of a bike. They come with different bends, in an array of heights and are available in every color, so there is a bar out there for everyone. The most important thing to look for when shopping for a new bar is a shape and size that works well with your body type and riding style. Understanding handlebar specs, which are categorized according to rise, back-sweep and up-sweep, will facilitate the selection process. Rise is quite simple. Ranging between zero and three inches, it measures the elevation of the grips compared to where the stem connects. High-rise bars provide more leverage by placing more of a rider's weight rearward and are popular on freeride and dirt jump/skatepark bikes. Low-rise bars put more weight over the front wheel, improving traction on climbs and in corners. They are very common on cross-country bikes and can be found on downhill and all-mountain bikes. Back-sweep refers to the angle at which the ends of the bar bend back towards the rider and up-sweep indicates how much the bar is bend upwards. The sweeps make a big difference in the feel of the bar and depend very much on personal preference. Handlebars are available in downhill, dirt jump/park, cross-country and all-mountain specific designs. Downhill bars are the widest (stretching out to 31.5-inches or 800mm). They vary between zero and two inches of rise, are made of aluminum or carbon fiber, require oversized stems and are built extremely strong. Dirt jump/skatepark bars tend to be tall with two to three inches of rise. They are available in chromoly and aluminum with both standard and oversize stem diameters. Cross-country handlebars are generally narrower than the rest (around 27-inches or 685mm). They are made of aluminum or carbon fiber and are generally low-rise at less than one inch. All-mountain bars fall somewhere between cross-country and downhill specific models in both width and rise, but have similar bends and are available in the same materials. Handlebar sizing depends on width, rise and stem clamp diameter. Mountain bike bars range in width from 26 to 31.5-inches (680-800mm), rise ranges from zero to three inches, and the two available clamping diameters are standard 25.4mm and oversized 31.8mm. All-mountain, cross-country and downhill bars are available in aluminum and carbon fiber. Dirt jump/skatepark bars are available in aluminum and chromoly. Mountain bike bars range in price from $30 to $275. Models in the $30-$75 range are available for all types of riding in most rise options, an in either aluminum or chromoly. These products deliver durability and strength at a competitive price. Moving up to the $75-$150 range, top of the line aluminum models and a handful of carbon fiber handlebars become available. Products in this range are well worth the extra coin and are a worthwhile upgrade for any bike. 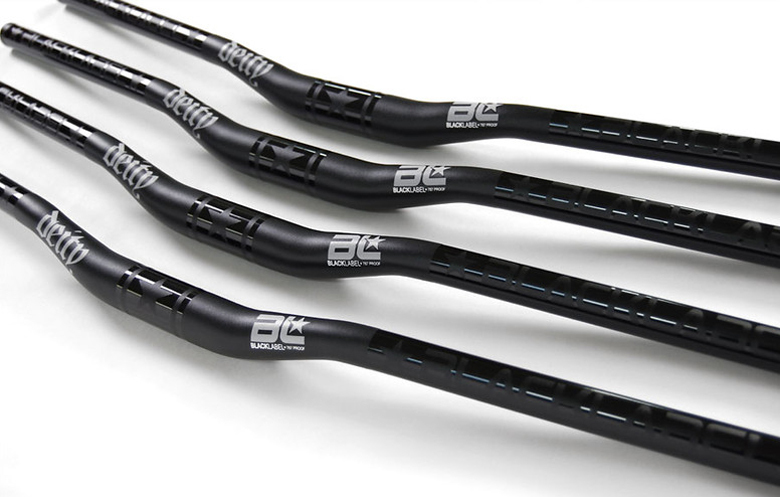 Bars costing between $150 and $275 are generally ultra-lightweight carbon fiber models intended for competition level downhill, cross-country and all-mountain riders.